For nearly a week now a mystery has surrounded the Olympics and it wasn’t what country would reign supreme: why did those pools turn green? Officials have run the gamut on possible explanations, including algae bloom and a chemical imbalance caused by too many people using the pool. Now, Olympic officials are handing out a final verdict on what caused the pools, which should’ve been all prepared for a Summer Olympics but weren’t, to turn murky and green seemingly overnight. According to the New York Times, somebody accidentally added 160 liters of hydrogen peroxide on Aug. 5 to the pool used for diving, which neutralized the chlorine and caused it to turn green. Basically, eliminating the chlorine allowed for the growth of “organic compounds,” including what might’ve been algae. Hydrogen peroxide can be used as a cleaning agent for pools, but not when combined with chlorine. The former neutralizes the latter, which doesn’t help when electronic monitoring systems have to measure the amount of chemicals in the water. Gustavo Nascimento, director of venue management for the Rio Olympics, said in a news conference that the monitors did pick up the chlorine, but failed to notice that it was no longer working. So before the synchronized swimming event on Sunday, where athletes kind of need to see each other underwater in order to perform, officials said they had plans to drain the 3.7 million-liter pool and replace it with clean water from a nearby practice pool. By Sunday, according to NBC, the pool was back to its correct color. So the medium in which athletes, some who traveled thousands of miles to compete, can perform and show off what they’ve trained years for, is now back to a state where it won’t harm or hinder their results in any way, which is a good baseline for the Olympics. Officials are of course embarrassed by the instance. 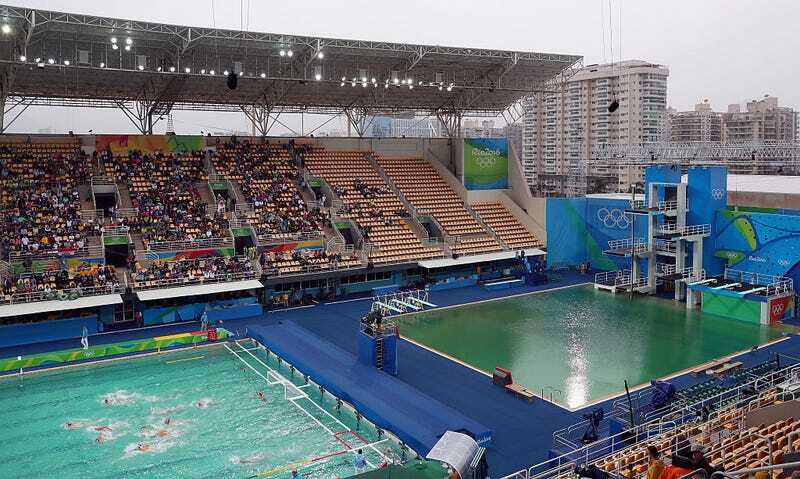 How Much Pee Would It Take to Turn an Olympic Pool Green? Who Cupped Michael Phelps Before He Won a Gold Medal Last Night?